Happy Father’s Day to all the wonderful Father’s out there! Come bring the family and grab a canoe, kayak or SUP to have some fun on, and then BBQ some of your favorite foods on our lawn area! 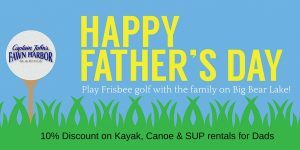 All the Father’s out there, just mention Father’s Day and get 10% off your canoe, kayak or SUP rental.